I had the dream about five months after starting a job as photojournalist at NASA Langley Research Center in Hampton, Virginia. My photographs of aircraft and spaceship models, lasers and research planes, test pilots, astronauts, and scientists were being published all over the nation and internationally. My articles appeared in NASA publications. It was an exciting time in my life. The dream had come the night after my last date with a man who had asked me to marry him. I had declined. This was not easy to do because the man was a millionaire, and I was a single mom with three almost-college-age youngsters. Little did I know that the dream was just the beginning. Little did I realize that I had just begun an amazing spiritual journey into the unknown, and I was about to unravel one of the deepest mysteries of who we really are. The morning I awoke from that dream, I had no idea that something much greater than myself had been set in motion and my life would forever be changed. At the time, the children and I lived in a little house on a street adjacent to the Chesapeake Bay. Among the four of us, we shared one bed: I slept on the mattress, the girls used the box spring, and my son spent his nights on blankets piled on the wooden floor. When the children and I had moved to Virginia Beach from Phoenix, we could bring only what we could fit into our old 1970 three-quarter-ton Ford window van. After we packed our clothes, dishes, pots, books, typewriter, stereo, toys, and my camera, there was no room for any furniture. Our most precious passengers were our little terripoo dog, Muffin, and our four cats. We couldn’t leave our beloved pets in Phoenix because they were a part of our family, and they gave us a sense of home no matter where we were or what happened to us. My new job in Virginia, with a NASA contractor, paid enough for food, clothing, and school supplies, but we had to find our furniture on the side of the road on bulk garbage days. It had not been easy to say “no” to my millionaire friend. He had taken me to lovely waterfront homes where he wanted us to live. How I missed having a nice home! We had had to leave Phoenix because our four-bedroom house with the in-ground pool had been foreclosed on when the children’s father didn’t pay child support for two years. However, although we appeared to be destitute during those terrible years, our struggle to survive had brought us together as a family. The children and I had learned to trust and depend on each other. “One for all, and all for one,” we used to say. We found that, over and over again, things would work out. For example, when I went back to school to get my degree, one of my fellow students happened to be a mechanic who insisted on repairing my old vehicle—in the parking lot of Phoenix College. I typed his papers in return. It was as if the children and I were in spiritual training. My ex-husband had done me a favor, because when he threw me out of his life, I landed in God’s arms. When our air conditioning broke, we had to sleep on lawn chairs on the patio around the pool. As we fell asleep, the whole sky would be open above us. Sometimes we’d see a plane or a satellite traveling among the stars. Other times, there’d be heat lightning coloring the mountains that surrounded the valley. It was heavenly to slumber with a breeze fanning our sleeping bodies. I’d come to appreciate even the smallest things—like being cool enough to sleep. The beauty and tranquility of the night sky will remain forever deep in my bones. I remember those nights under the stars, my children beside me, our dog and cats nearby, as one of the happiest times in my life. There is a remarkable peace to appreciating even the smallest things. It was a time when I was closest to God, a time when it was easy to end each day with a prayer of thanksgiving: thanks that we had shelter for one more night, thanks that we had food for one more day, thanks that we had each other, and thanks that God’s world resounded with beauty, drama, and peace—a peace that passed understanding. Therefore, although it would have seemed as if the millionaire was a gift from heaven for all the years we had gone without even the necessities of life, the children and I were not really as needy as we appeared to be. We had immense faith that we could triumph over anything. So I could not say “yes,” because I did not love the man, although I admired and respected him. I did not want another marriage like the first. I wanted a soul mate—a twin soul. With the wisdom of hindsight, I suppose the dream telling me the man I should marry came because I had kept to my ideals and resisted being swayed by the temptation of living well financially. I was holding out for love. The entry in my dream journal was dated March 28, 1990. The first part of the dream was about the actor “Godunov,” who played the husband destined to marry the single mother in the movie Witness. In the dream, Godunov had this “high up” house that he had designed, a black lab-type dog, and a dark-haired male friend with a dark-haired wife. There was a satellite that represented someone’s work. In the next part of the dream, I saw a stage. In the spotlight center-stage, stood a tall, husky man with reddish-blonde hair standing with his back to me. As if on a turntable, he slowly rotated until he was facing me. I liked how he looked. He smiled a soft smile at me. When I awoke, I assumed that my dream was telling me I had made the right choice in not marrying the millionaire. There was someone better out there for me, the proverbial plenty of fish in the sea, represented by the man in the second part of the dream. I’d been keeping a dream journal for years and knew that dreams sometimes used words cleverly. In this case, “Godunov” sounded like and probably meant “good enough.” Therefore, my unconscious most likely was telling me that somewhere out there was a man who might not be a millionaire but who was, nonetheless, “good enough” for me. It never occurred to me that the man in the dream was a real person I was about to encounter. You can imagine my astonishment when I walked down the cafeteria aisle next lunch hour, tray in hand, and I saw a man standing with his back to me filling his glass at the water fountain. I had been scanning the tables, looking for the friends who usually ate lunch with me. Searching for a familiar face, I was surprised to discover that this man at the water fountain looked like someone I had met before. He was a big man with a broad back and was wearing an orange-brown corduroy jacket which set off his reddish-blonde hair. As I walked by, my eyes at the level of his elbow, I glanced up at his face. It was the man in my dream! And I found him wildly attractive! My heart pounded madly. I almost dropped my tray. I wanted to shout, “What were you doing in my dream last night?” But instead, I thought, “Hold onto your tray!” I was afraid I might faint. It took all my concentration to act normal in this cafeteria of hundreds of people. I turned away, not wanting to stare. My breath came in short, quick bursts. I could feel my face redden and little beads of perspiration appeared around my mouth. There are no etiquette manuals describing the proper behavior upon meeting the man of your dreams. There are no talk shows bringing dreamer together with dreamee. There are no articles in women’s magazines telling how various people handled their first encounter with a man they’d just dreamt was their future husband. I found my lunch friends and sat down, hoping my heartbeat couldn’t be heard in the next county. “Uh, low blood sugar I guess.” I didn’t know what to say. And so I said nothing more about it, talking about anything and everything else—yet all the while looking over to where he sat. The only clue to my state of mind was a slight tremor in my hands. I felt like a young girl in the high school cafeteria. When I got home that evening, I wrote in my dream journal: Just saw the man in my dream. He has a mustache and is chubbier—but nice. Looked at his hands—no ring. You would think that now that I had found him, we would soon be living happily ever after. Sorry, this is a true story, not a fairy tale. To begin, I was afraid. What did this mean, literally meeting the man of my dreams? What was going to happen to me if we got together? Was I in the grip of some kind of destiny? 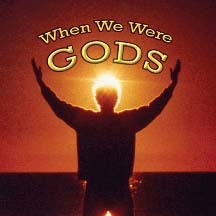 Continued in When We Were Gods.